Where are we on the prophetic end times timeline? Don McGee: I believe that we are at the point where the return of Jesus for the Church — commonly called the Rapture — is imminent. I don't think that we can say any longer, "Well, it is going to come soon." Although I understand what people mean when they say that, I believe that imminent is a better word because it could happen at any moment. Imminent means it could happen right now. There is no delay. There is no prophecy that must be fulfilled and no event that must happen. It could easily happen today before sundown today. Dr. Reagan: The signs of the times do not necessary point to the Rapture, but they do point to end time events like the Tribulation and the Second Coming, right? Don McGee: There are two kinds of signs that you could look for in the Scriptures. You can go to Matthew 24 and read about events that Jesus said would happen during the Tribulation period. We are living in the shadow of those events right now, even today. All you have to do is look around and see what is happening in the world. Secondly, you can go to 2 Timothy 3 where Paul describes to Timothy how people will be living in the last days. I believe Paul was talking about the last days of the Church Age. I believe these two kinds of signs are a synergistic thing. When you take what Paul said about the events that would occur at the end of the Church Age and combine those with the events that Jesus said would happen during the Tribulation, then you have an increase in intensity and in volume of a world that has gone haywire and so requires the return of Jesus. Dr. Reagan: Well, certainly, as you begin to look at the prophecies concerning the Tribulation and the Second Coming of Jesus and the signs that indicate those happening, we can look around and see those signs all over the place today. We can know for certain that the Rapture has to be right around the corner. And, moreso than ever before, right? Nathan Jones: Two lessons that we as Christians should learn concerning an imminent Rapture is what Paul (2 Cor. 7:1) and John (1 Jn. 1:9) taught — that this should purify our lives. If we really believe that Jesus could come back at any moment for the Church, then that should be reflected in how we live. It should be reflected in our zeal for evangelism and it should be reflected in our living holy lives. Dr. Reagan: As many know, I grew up in and attended a church for almost 30 years and never once during those 30 years did I ever hear the word Rapture. In fact, after 30 years of going to that church, if you had asked me what the Rapture was I would have said it was a sensation you feel when you kiss your girlfriend. So, tell me, just what is the Rapture? 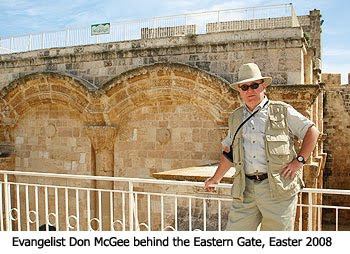 Don McGee: I was very fortunate that the church group that I was raised with talked about the Rapture all of the time. What the Rapture means is that Jesus is going to come back in the air. That event will be heralded by a trumpet and the voice of the Archangel. Death will release its hold upon Christians in that there will be a resurrection of Christians. This is a family affair and not a general resurrection that includes the unsaved. Christians shall be raised up and united with their immortal, glorified bodies to meet the Lord in the air. Then we are going back to Heaven for a period of seven years. That is the Rapture. Two groups of believers will be caught up to Christ. Those who are alive at the event will be caught up, and also those who had already died will be caught up. The dead will be caught up first, then those who are alive will be caught up second. But, the catching up of both groups of believers is all going to happen in a period of time that is so fast it is just so hard to imagine. Dr. Reagan: So, you are saying the Rapture then is an event that is separate and apart from what we usually refer to as the Second Coming? Don McGee: They are totally separate and apart. They are not associated whatsoever. Now, they are both the return of Jesus, but it is going to occur in two stages. That's how a lot a people would put it, anyway. First to occur is the Rapture before the Tribulation, and then Jesus' victorious return thereafter. We could have the Rapture happen even right now, and then when that happens afterwards at some point there will be a seven year period of time in which Jesus is going to deal with the Jewish people to bring them back to a saving knowledge of Him. Then, at the end of that seven year period we have the Second Coming of Christ. There are no events that have to occur before the Rapture, but there are certainly events that have to occur before the Second Coming. For example, after the Church is taken out a man is going to arrive upon the scene. This guy is going to be a world ruler who is commonly called the Antichrist, in fact that is what God calls him in His Word. This man is going to have the answer to the world's problems, and again all you have to do is look around you and see that we have plenty of them already. If any man comes upon the scene and says, "I can fix that. I can give you peace and security and prosperity," then you can be sure the whole world will go for him. That's going to happen. This man is going to sign a document with Israel which also protects him, too. Also, the Temple in Jerusalem is going to be rebuilt because we know that at the three and a half year mark in the middle of the Tribulation this Antichrist is going to go into that Temple and declare himself to be God. Dr. Reagan: The moment we start talking about the return of Jesus I can imagine people just tuning out because they are thinking, "Oh, here is one of those crazy guys that sets dates. He is going to tell us the date Jesus is going to return." When we talk about the season of the Lord's return, we are not talking about a date, are we? Don McGee: No, no, students of Bible prophecy have been accused of date setting. Most of the world is familiar with Harold Camping who was predicting that the return of Jesus would happen on a very specific date last May. Sadly, date setters have been around for a long, long time. The press always focuses on them, especially when their dates come and go. People use these failed predictions to make fun of Christ and His return. People say, "Uh-huh, look at those Pre-Mil, Pre-Trib people out there. They are a bunch of crazies. The season of the Lord's return, why we are living in it right now." I can't tell you what will be the hottest day of the year. I just can't predict that date. But, I can tell you the hottest day of the year is going to be in the summer time. Likewise, I can't tell you what day Jesus is coming back, but I can tell you that we are living in the season of it. Dr. Reagan: The Lord wants us to know the season of His return. He certainly does. He does not wish that any should perish. He always, always warns before He pours out His wrath, and there is going to be great wrath poured out by God after the Rapture during the Tribulation. God does not want any to perish, so certainly He is going to give us signs to watch out for. Don McGee: That is absolutely correct. One of the greatest signs of the Twentieth Century was the re-establishment of Israel. That was the pivot point. That's where you go first and then begin looking at the other signs such as the signs of nature and the signs of technology. If you look at the world you can agree that we are now a becoming a world-wide citizenry. People don't even want to talk about borders. That is an indication that the whole world is coming together in a situation when the Antichrist can say, "I've got the answers and solutions, not just in your geographical area, but for the whole world." Dr. Reagan: Nathan, you are on the Internet every day talking to people all over the world. Do you sense that people feel like we are living in the season of the Lord's return? Nathan Jones: Especially among the people on the Internet who I talk to, there has been a great awakening due to all of the natural disasters afflicting the world lately. There's no doubt that we've been having a great increase in natural disasters. Before all the destruction the weather's caused people were not paying much attention, but now they are paying attention. Dr. Reagan: It is amazing how natural disasters can get people's attention. When I was a kid living in Waco, Texas, in 1953 they had the worse tornado in the entire history of the state even to this day. Over 100 people were killed and the town was completely devastated. We had standing room only at all the churches, and it didn't matter whether they were Episcopal, Presbyterian, or whatever. We had standing room only for about six months, and then people started forgetting and drifting away again. But, there is something about God speaking through nature which He has done all through history that gets people's attention. Don McGee: I think one of the reasons what is happening in nature gets our attention is because what happens in Japan for example affects what happens in America. We're all tied together. Look at the impact of Japan's earthquake and tsunami. It's not just a weather situation or a seismic situation, but it also affects the economy. It effects the provisions like the supply of food and clean water. Also, the radioactive clouds that moves across the earth affects us all. These are forces that we have no control over. Just look at what the volcano is Iceland did. It pretty much shut down Europe. Dr. Reagan: These things are definitely increasing in frequency and intensity. Nathan Jones: God does this to make sure the people like in Waco don't fall asleep again, or like we did after 9/11. God is constantly reminding us to stay in our relationship with Him and be watchful for His Son's soon return. In the next part of our discussion with Don McGee concerning the end times, we'll ask him if Matthew 24:14 means the Gospel needs to be preached to the whole world before the Rapture can occur. We are close enough, to feel our ears pop, like a plane as it rises up into the sky.